Following the development of my new found crocheting skills I have been working to produce what will eventually be a blanket. 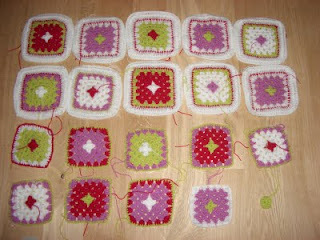 Here is my progress so far....I have 20 squares in varying degrees of completeness, think I need 30-40 squares for a blanket so am at least 50% there. Think this is going to come together really well. How many hours work so far?